I would now hand the comm over to Joe Nazarro, the accomplished and heralded Star Trek commentator since the early 90’s, and author of Star Trek: The Art of John Eaves. I’m quite sure his ready room is fully equipped with star charts plotting our journey through wormholes and asteroid belts, an away team at his beck and call to investigate any anomaly discovered, and a few bottles of Klingon chech’tluth awaiting consumption. He would nod with a knowing expression on his face as he withdrew The Art of John Eaves from a hidden compartment, and we would all lean expectantly forward, and our expectations would be obliterated like an uncloaked Romulan Warbird facing an array of Federation plasma cannons. Upon first inspection, The Art of John Eaves is stunning. A beautiful jacket featuring the Enterprise E and a Cardassian Deep Space station greets us, a little eye candy taste preceding the meal within. A solid binding and thick bond paper matches the surprising weight of this collection. Flipping through the first few pages, one begins to understand the breadth and scope of this work. It’s astounding! Concept art from med-bays, the bridge from the Enterprise B (Generations), and my personal favorite: the Borg artwork from First Contact. In full disclosure, when I first received this book, I scoped ahead to see what was offered in terms of the Borg, and I was slightly disappointed to find only a few pages of my favorite enemy. However, the narrative given by Eaves regarding the difficulty he had separating his art of the Borg Spheres from the Star Wars Death Star was more than enjoyable to read. About this point in time I realized the sun has long since set, and I had been jotting down notes on my ‘first impressions’ of this book for over an hour. I was simply lost in the awesomeness and, like the Nexus, I found that time is the fire in which we all burn. I hastily pulled my scorched supper from the stove and ate the blackened and crystallized vegetable soup with a touch of chagrin. This is a great book, as evidenced by my lack of attention to sustenance. Belly full, I settled in to immerse myself in the television and movie art that had so long been a part of my life. Perhaps a better wordsmith than I can describe for you the absolute magic encompassing these two hundred and seven pages of full-color journey through Roddenberry’s universe, but words won’t matter – this is art, and damn good art. Any Star Trek aficionado worth a drop of salt in the ocean would have this book at the ready in case questions arise with respect to knowledge. A prolonged study of this collection would allow even the most general of fans to be quickly vaulted into the upper echelon of Trekkies. The wealth of information coupled with the incredible drawings contained within leads one to the path of enlightenment. As a case study, I promised a fellow Trek fan a few difficult-to-find beers on a Greco-Roman evening that ends in -Day if he could stop by after work. He arrived post-haste and said hello as he yanked a pint glass from the cupboard and rummaged around in my fridge, as is his custom. I had placed Titan Books’ Star Trek: The Art of John Eaves on the table, in a pile of moderately unpaid bills and my children’s artwork. We had some sips, enjoyed some laughs, and eventually the conversation wavered. His attention was suddenly yanked from our general tomfoolery to the beautiful cover of The Art of John Eaves. He spent the next ninety minutes flipping pages and discussing the ramifications of the concept art and the reminiscing of movie moments the book produced. Spirited debates ensued. Beers were drank with great abandon. Good times were had by all. 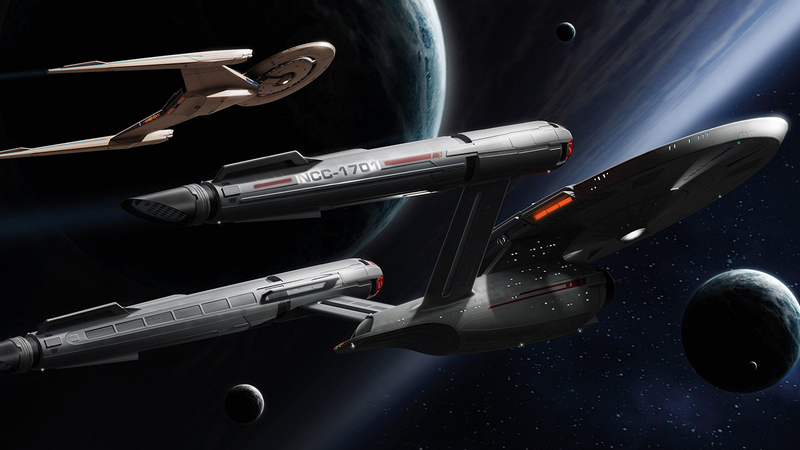 You can purchase Star Trek: The Art of John Eaves via Amazon or directly from Titan Books.